A buddy is in town for one night and he's staying around 300 N Dearborn. Planning to meet him for dinner and drinks Wed night somewhere close to him. Any recommendations? Nothing too extravagant, just a nice place to hang out and catch up for a couple hours and have some good beer and bar food. Purple Pig! Eataly also be a good option. Be prepared to figure out how to handle the typical 2+ hour waiting times at Purple Pig. And it's not a place to sit around for a couple of hours, given those waits. Better bets include Shaw's Crab House (either the restaurant or the oyster bar), Quartino, Sable, or The Kitchen, and you can make reservations at any of them. Last edited by nsxtasy on December 4th, 2017, 6:33 pm, edited 1 time in total. Obviously plenty of places to go around there. If you don't want to be too corporate I'd recommend Monk's on Lake street (Lake and Wells). It's pretty low key (beer, bar food) with the peanut shells on the floor. If you have more exotic tastes, Slurping Turtle on Hubbard is very good (or at least it was the last time I was there). Excellent Ramen in an interesting space. Most places in River North are pretty decent, just a matter of willingness to deal with the crowds and the prices. The Dearborn (145 N. Dearborn, SE corner w/ Randolph) is the play, unless you really prefer a more bare bones bar-feel (eg. Monk's). Prices aren't crazy, ambience is less obnoxious than River North. Two more great options are Miller's Pub on Wabash for an old timey pub type feel, and Revival Food Hall for a modern food hall with all kinds of food options (food open till 7, bar open till 9). Deep-dish is another option, at Lou Malnati's on Wells, Pizano's on State or on Madison, or the original Uno or Due. I also like The Kitchen, Sable, and has the hype calmed down at RPM Italian? RPM steak has a great burger according to my husband. Both are in that area. If you want an Irish pub with really good food -- I'd check out The Emerald Loop on Wabash at Wacker (216 N. Wabash). Pretty darn fine food and some good drinks. Very convivial. if you want an Irish pub with really GREAT food -- then venture a bit into the Loop and hit up The Gage -- which will take reservations. It's on Michigan Avenue between Monroe and Madison (24 S. Michigan) and will take reservations on Open Table. I love the Gage -- it's a foodie's gastropub and it's friendly and well-run. They also have really interesting desserts, which always makes me happy. Oh...and a poutine option that I have to balance against the dessert. I can have one or the other but not both. I like The Dearborn Tavern (Dearborn & Randolph) and Cochan Volant (Clark & Monroe) as options in the loop. You can get good bistro food and can hear yourselves talk. LOVE the Purple Pig, but I agree you would need to be up for a wait. earthlydesire wrote: If you want an Irish pub with really good food -- I'd check out The Emerald Loop on Wabash at Wacker (216 N. Wabash). Pretty darn fine food and some good drinks. Very convivial. Ditto on the vote for The Gage! I also like The Dearborn; it's owned by the people who own The Gage and is a lot closer to your friend. I would also put in a recommendation for Quartino's and the Watershed bar. Located in the basement of a Pop's on Champagne, Watershed is a very low key place that focuses on local beers and spirits. It's a great place to catch up with friends, though I think it only has snacks. Thanks for posting that map, it reminded me that Christkindl is going on and is right down the street. 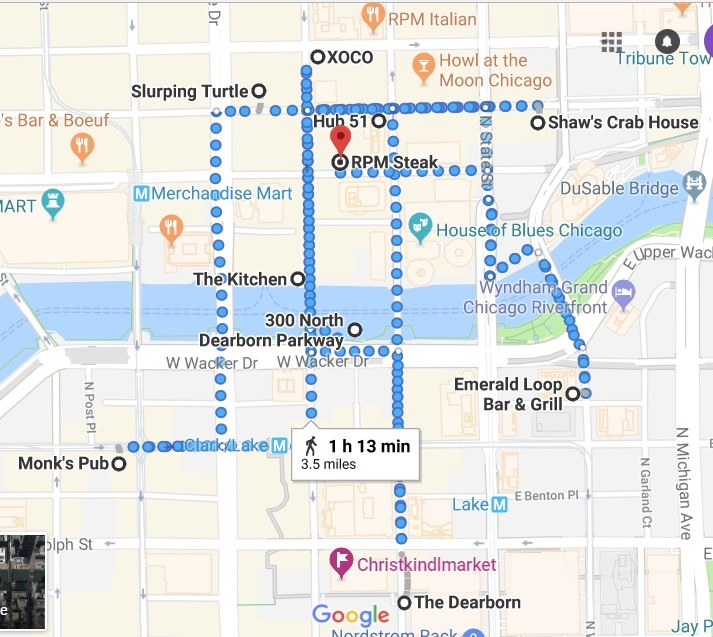 Plans have been finalized, meeting at Christkindl for a drink and then heading to the Dearborn for dinner. Tried going to the Dearborn, but it had over an hour wait so ended up at Kitchen Bistro. It was solid. shakes wrote: Tried going to the Dearborn, but it had over an hour wait so ended up at Kitchen Bistro. It was solid. It's always a good idea to make a reservation in advance, so you can get into the place you really want to go, or at least you don't have to make a trip only to find out that the wait is unacceptably long. Glad it worked out anyway! nsxtasy wrote: Two more great options are Miller's Pub on Wabash for an old timey pub type feel, and Revival Food Hall for a modern food hall with all kinds of food options (food open till 7, bar open till 9). Ditto on these two recs.